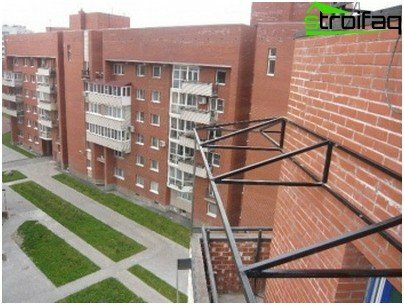 On the issue of the construction of the roof on the balconyfacing the owners of "single" balcony (arranged piecemeal with respect to the wall) and the inhabitants of the upper floors in older homes. These balconies have a roof plate on top and before a roof on the top floor balcony was not provided. 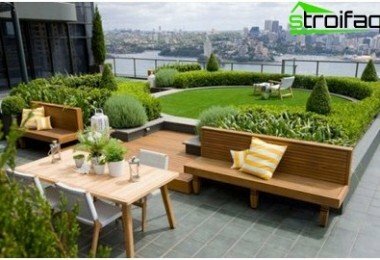 But if you want to make full use of the balcony space is not just when it's warm, but in the cold and wet weather and, especially, if it is planned to expand and insulation, then necessarily need a roof to the balcony. For information on how to build it correctly, and will be discussed in this article. 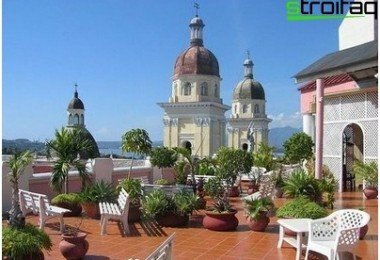 To the balcony roof presented a few basic requirements: its design must be reliable and durable; it should be aesthetically pleasing, so as not to spoil the look of the house facade. independent (attached to the outside wall, without stands). Let us consider each of the options. This embodiment requires more material roof andtime-consuming. However, this method you should choose, especially if fully glazed balcony is planned, where the uprights are useful for glass assembly. Dependent roof structures are reliable andwithstand heavy loads, so you can choose any roofing material for them. The advantage is the fact that the length and other dimensions may be dependent on any roof. In addition, it is easy and convenient to attach the glazing profiles, it is possible to insulate the various insulating materials and this makes it possible to equip a warm balcony. inability to thoroughly insulate the balcony because it is impossible to fulfill his quality glazing. Important! Since the roof on the top floor balcony of the house will have to withstand heavy snow loads, it is not recommended to use a hinged roof option. 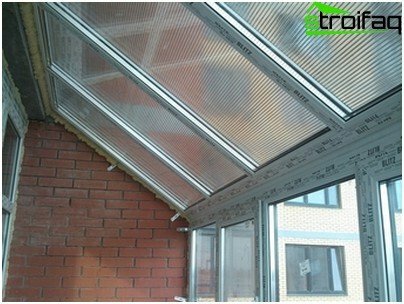 polycarbonate sheets or special windows for the roof. The most advantageous in terms of price / qualitymaterial is profiled decking. They can cover any roof balcony. 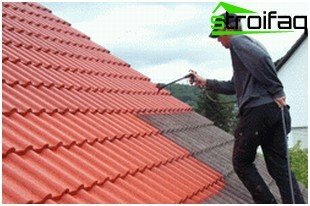 It is characterized by a good structural rigidity, therefore, does not deform under the influence of snow and wind loads, which means that in the future will not have to repair the roof. The only drawback - the need to hold such a noise insulation of the roof. 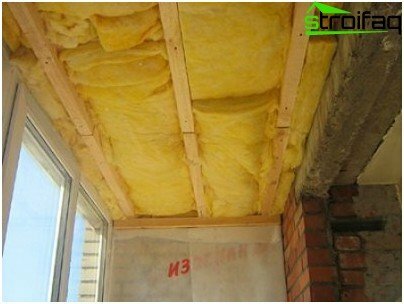 But the problem is the presence of a wide variety of sound-insulating material is easily solved today. When using soft materials for roofing eliminates the need for additional sound insulation of the roof, but the need to create a rigid frame for it. 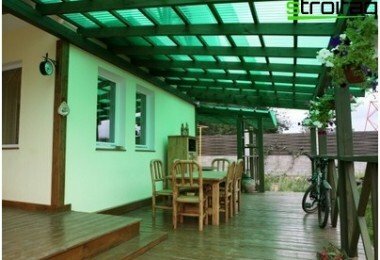 Polycarbonate sheets are used for the roof onbalcony, when it is expected a warm glazing option. This material is 15 times lighter than glass, but has the apparent brittleness and high impact resistance to UV radiation, so it is not destroyed during the operation and does not lose its transparency. Its temperature range of - 45 to +80 degrees Celsius. 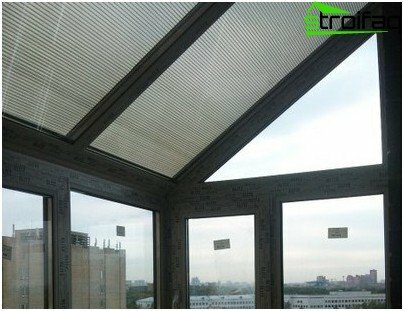 The most expensive material for roofing - itdouble-glazed windows for the roof, which are made of tempered glass. They are reliable, well keep warm, do not absorb moisture, are long. Windows are not afraid of any mechanical effects because the materials used to manufacture them - are strong and reliable. Glazing of balconies with a roof with the help of glass - the simplest option, which does not require large power costs as windows manufactures and installs herself manufacturer. Finally, a transparent roof on the balcony looks very impressive. Prepared in advance metal girders are attached with anchors, recessed into the wall of 8 cm. By mounting a metal trusses made of wooden crates from the boards. Wooden structures treated with preservative to protect against rotting. Trapezoidal sheet is cut into desired sizes usingspecial scissors or a hacksaw for metal. Use grinders for cutting sheets are not recommended because of their edges in this case will come quickly into disrepair. These elements of trapezoidal sheet is fixed to a wooden crate with screws with washers. Formed between the sheets and the inside wall of the slot is filled with foam and the outer joint portion is embedded with cement mortar (cement and sand of 1: 3) and treated with an adhesive sealant. 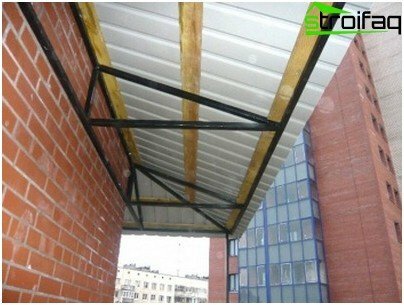 If you plan to make repairs glazing, then the edges of the roof should be installed beams, which are then mounted frame. Held glazed balcony. The gap between the roof and the frames inject assembly foam and from the outside is carried out waterproofing sealant. You can also mount ready already glazed windows. 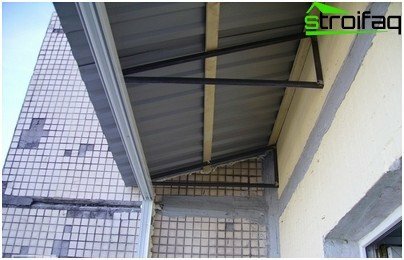 If you intended to use the balcony as an additional living space and his need to insulate thoroughly, then under the steel sheet is recommended to use a waterproofing membrane. On the lower side of the roof structure by any insulatedinsulation material (usually mineral-wool), and then sutured to a heater insulation film. It is best to use mineral wool with foil to avoid it spilling inside the balcony. Council. We must not forget to make a tight docking insulating materials: solid - with the help of foam, roll - adhesive tape. And further. If the balcony is made watertight, we recommend a balcony roof vent to the apartment did oxygen. This recommendation for some reason, often neglected. you can not save on the quality of the materials used. Be aware! The device of the roof on the balcony with his hands quite a dangerous thing, as the work is carried out at height. In this case, better to cook on the ground support structure, sew her crate and corrugated board, and then secure it by lifting the desired height. At this point, we can assume that the installation of the roofon the balcony completed. It remains only to perform interior decoration suitable for this material - paneling, drywall or siding. 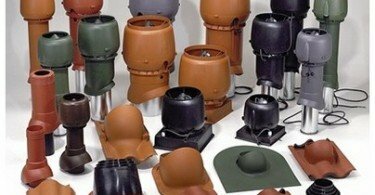 Outside finish also perform various finishing materials. 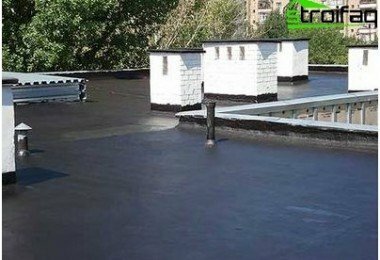 It is only necessary to pay attention to characteristics such as impact resistance, durability and waterproofing surface.